We are a young Global JobBoard platform aimed at helping companies hire Global Talent and jobseekers. Likewise, we aim to help jobseekers find that dream international job at home or abroad. Founded by a team of entrepreneurs who have made the move abroad and now feel it is their time to assist you. How is Job Coconut different? Where will we be active? When to use Job Coconut? 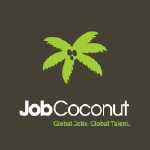 Use Job coconut when looking for an internship or Job in a global operating company. Regardless of what type of employment you are looking for when it is Global we are your first choice! As you can already see we have an unusual name and want to stand out from the crowd. We believe that with our focus on being more than just a job board you will say: "I’ve gone coconuts about Job Coconut!"